Allergy Advice: Made on an equipment and/or a facility that also processes peanuts, tree nuts, wheat and milk. Storage Instruction: Keep in a cool dry place and avoid storing near any source of heat. 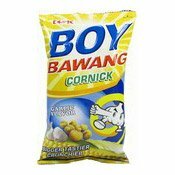 Ingredients: Whole Corn Kernel (90%), Vegetable Oil (Coconut And Palm Oil), Garlic (2%), Salt, Flavour Enhancer (E621), Sugar, Chilli Powder.